I worked with Annmarie and Ian for just over a year, and it still felt like the time flew by. They’re the type of people who are the most fun at parties — they know a little bit about almost everything, and have great senses of humor. They were into having a few traditional elements mixed in with totally unique ones (like giant gummy bears instead of wedding cake) which made the process extra fun. And of course, like all Davis Row couples, were all about their guests having a blast. 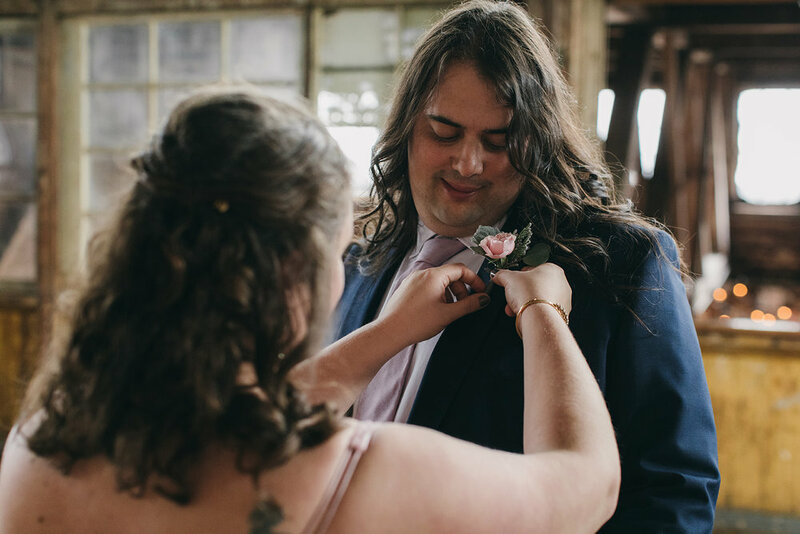 Annmarie and Ian both had their hair done by Alli Wolf, before Annmarie headed over to have her makeup done (by Shannon Grey Williams) and finish getting ready with her bridesmaids and family at The William Vale (a neighborhood favorite). 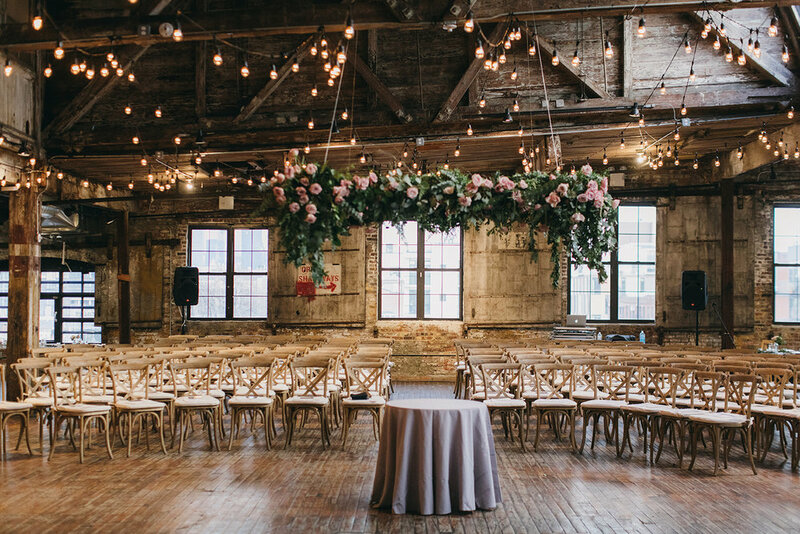 Meanwhile, we oversaw a gorgeous setup at Greenpoint Loft completed by Rosehip Social and Universal Light & Sound. 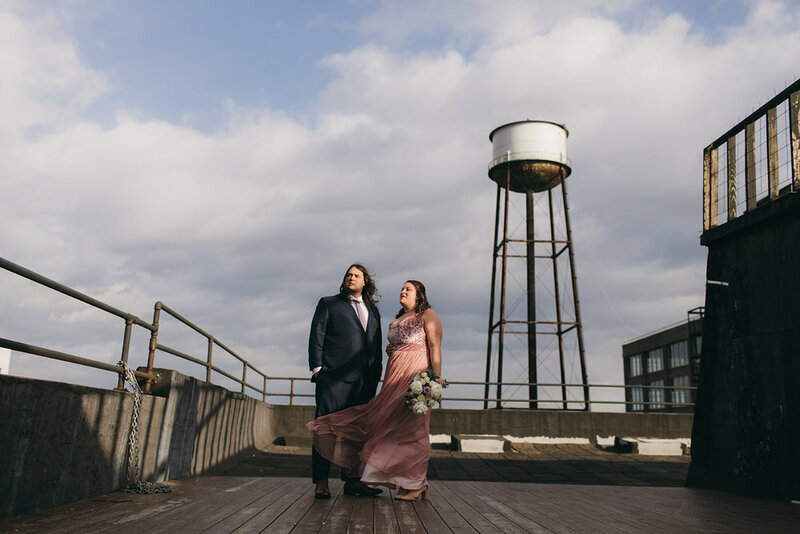 The loft space at the venue was the perfect location for the first look, and they both looked great — Ian in a custom suit from Brooklyn Tailors and Annmarie in a custom gown from Sandra Usherov. The ceremony was officiated by a close friend of the couple (who looked so sharp in her suit), and took place in the center of the room with their friends and family surrounding them — we carefully designed the floorplan together to ensure that neither Annmarie nor Ian had their backs to the guests. They weren’t loyal to the aisle tradition, so we tossed it, and they were still able to make a grand entrance. Music all night was handpicked by DJ Monamie. A beautiful dinner (with a pasta course!) was created by Ryan Brown Catering. Judging by the big smiles we saw all night, our lovely couple and their guests enjoyed every minute. Beautiful photos by our friends at One Night Cereus.